Update (Oct 2013): For anyone who stumbles across this, I've posted an update where I got the proprietary driver to work acceptably (but only on single screen). 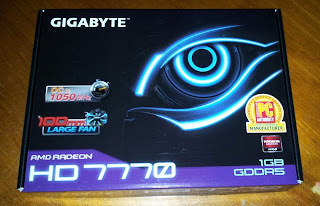 After researching and asking around on forums about GPUs and Linux, I decided to get an AMD Gigabyte HD7770 1GB as an experiment. From what I could gather, AMD support in Linux was pretty bad, (or at least, more problematic than nVidia cards), so I went in with low expectations, willing to wear the difference of flogging it off secondhand if it didn't work out. TL;DR: It wasn't all bad, but nothing "just works" (as was pointed out in forum responses). From my experience, I have to conclude that the AMD Linux drivers are effectively broken at the moment. Despite being warned away from AMD cards, the 7770 is an entry-level gaming card and not overly expensive. It was also overkill for the games I expect I would be trying to play (of which there isn't a huge selection on Linux yet anyway). Since it wasn't too expensive ($119), I was willing to take the risk and try it out, partly for the chance to experiment, partly because AMD are reckoned to be good value for money in that price range, and partly because AMD at least supports an open source driver (for varying degrees of "supports"). Hooked into the i5 3470 system I built in December 2012, running LinuxMint 14 (Nadia) Cinnamon 64-bit. On with what I found. Quick and easy. Dropped right into the PCI-E slot without the firm coaxing that RAM and SATA cables usually need. I chose the second port because it looked like the USB 3.0 cable might get in the way of the card. After I put it in, I thought it probably wouldn't have been a problem, but I left it where it was. Plug in the 6-pin power cable and away we go. 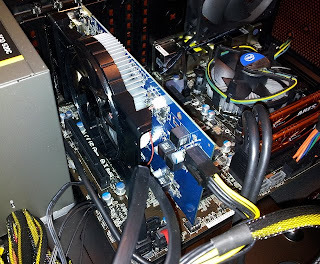 Note: If I'd got the slight less powerful 7570 (which I was considering) I wouldn't have needed the power, but I got a beefy PSU and it seemed a shame to not try out some of those cables sitting around in the bottom of the case). With the GPU plugged in the on-board graphics is disabled. This is (I gather) expected behaviour. After plugging in the GPU and booting up, I didn't have have to do anything in particular. LinuxMint 14 has drivers installed by default to drive the GPU. First test I plugged into the DVI port. It started up fine at full resolution. Mine displayed "[Radeon HD 7700 Series]"
Then I added in the second monitor. If you've ever heard someone claim the dual-monitor support in Linux is limited, you can believe them. Initially with both plugged in, only the HDMI monitor would work. The other monitor (plugged into the DVI, which was originally working), displays its "Current input timing not supported by monitor display" message. I worked out how to get things going by using xrandr, a command-line tool that configures the displays. By itself, executing xrandr outputs details about the detected displays. You need to know the "names" the system has given the monitors plugged into each port in order to control their output settings. In my case, the monitor plugged into the DVI port was "DVI-0", and the one plugged into the HDMI port "HDMI-0". This shifts the taskbar to the DVI-0 display. So, after using these commands to set up the displays as desired, I had to work out how to make the changes permanent. The "normal" way to do this (if that's the right word) is to put the configuration into the /etx/X11/xorg.conf file. 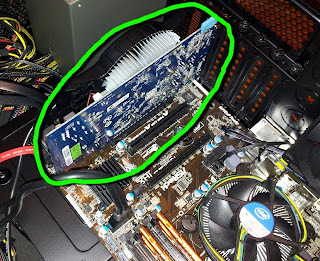 Identifier  "Radeon HD 7700 Series"
Something went wrong when I ran it though. At least, the HDMI-0 monitor got a new name, and became "HDMI-3". So it didn't quite work. Next I thought I'd try and set things up with xrandr, then go into the Preferences/Display dialog and use the "Keep current configuration" option to save the setup. This creates a monitors.xml file in ~/.config with the current settings. However, it only applies after you login. The HDMI screen, if plugged in, always seems to be considered the "primary". I tried a couple of other wild and fancy things that I found on various sites to set up dual screens, but in the end just gave up. No matter which way I plugged the monitors in, if the smaller 23" LCD was attached, it was the one that "lights up" for the splash screen. After login the 24" came to life, but not before. I couldn't work out how to get both screens going at the system level, rather than the user level, so I gave up. First test was running a fullscreen 1080p video. It ran with lots of glitches and jaggies when playing. The CPU went up to 50-55 degrees on all cores -- was is actually processing in software? Then I downloaded the Phoronix Test Suite. The suite package itself is reasonably small, but the full test suite takes over 5GB of download and can take a few hours. I managed to run a few of them, but none of them ran very well. For example, Nexuis looked like it was running at about 0.1 FPS. It was clear that, unfortunately, the open source driver was not even close. It seemed I could choose between the Catalyst driver from AMD's site, or one of the fglrx drivers that were listed in the software centre. I still haven't worked out what the difference between these two things is -- I think they're related in some way, but I'm not sure how. Bam! Upon reboot, the video was completely broken. 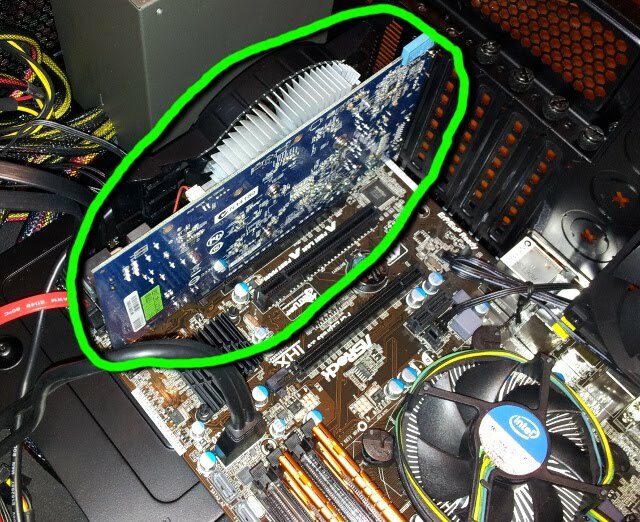 I could see the motherboard post, and then nothing -- not even a prompt. The onboard video also wasn't working (at the time I didn't realise you have to unplug the GPU completely for the motherboard to activate the onboard video). Fortunately, this fixed the problem. So I can't really recommend installing the fglrx-updates variant of the driver. Next I tried installing the Linux Catalyst driver from AMD's website. This was version 12.11beta at the time (see upubuntu.com/2012/08/install-amd-catalyst-128-on-ubuntu.html for the steps I followed). This driver seemed to work fine (it at least didn't black out my screen) but came with the "beta" watermark in the bottom right. To get rid of that, follow the instructions at askubuntu.com/a/216730. Unfortunately, getting dual screens set up with the proprietary driver was, if anything, more difficult than with the open source driver. Then I tried the amdcccle (admin) application to apply "Digital Monitor(2) -> Adjustments -> Scaling (0%)" This resulted in another refresh problem on the second monitor, where it would only update while the taskbar on the primary screen was animating during hover. So I gave up on the dual screen idea in order to get some testing done for the driver. With the dodgy dual screen setup, running the test application fgl-glxgears got 500-600 FPS, but was very choppy. Now running fgl-glxgears got around 2500-3000FPS. So, same driver but running with only a single screen instead of dual screen improved the performance of this benchmark application by 6x, and it no longer looked choppy. But this is a pretty simple little application, I wanted something with a bit more meat. So I installed xonotic and ran it up fullscreen (1920x1200) with the highest settings I could set. Within the game is ran just fine (too fast for my old hands), but my old eyes couldn't discern any difference between the "default" versus the "high" settings, so I'm not sure if I did it right. But, after running this (or, it seemed, any "fullscreen" game), the taskbar animation back in the desktop became choppy and caused tearing all over the screen. All this playing had taken a couple of weeks by this stage. I got recommended to run the sgfxi script at smxi.org (a "fix it all" graphics driver script). When I downloaded it and ran, it exited saying I needed to run it from outside X. Which was fine, I thought, so I tried to Ctrl-Alt-F1 into a console. But I couldn't see the console, at all. I could see the X session, but none of the TTY console (1 through 6) were working. Somewhere along the way I'd borked those. By this time I'd had enough "experimentation". Blew away Mint. I'm now running Xubuntu with the onboard video. Anyone want to buy a barely used Gigabyte HD7770? My experience has led me to conclude that both the open source and proprietary drivers for AMD GPUs on Linux are broken. The Intel drivers for the onboard video aren't without their quirks (for example, I find it really hard to configure the login screen to start on a specific monitor at a specific resolution, and setting up dual monitors is still a bit of a chore). But for the most part they work. With the AMD proprietary drivers I had crashes, no screen at all for a while, and dual screen setup was diabolical. With the open source driver I had tearing and I wasn't quite sure it was actually using the GPU to do anything. Hopefully I'll get an nVidia card at some point to get another perspective, but I'll be starting with pretty low expectations. What is bizarre is that with the proprietary Catalyst driver, it allows you to set dual monitors... except that the aggregate resolution can't be more than 1920x1920. Yes, the limit is square, that's not a typo. I could mess around in the conf a lot to see if I could force something, but this is a work machine and I need to be productive, not in a trial-and-error reboot cycle. I am also looking at the GTX 650 TI as a replacement, and I'm glad to see you had it working no fuss. Thanks for that info. Yeah, sounds like we had a similar experience. Just to note, I had a bad tearing problem with the nVidia card, ignored it for a while but it got to me eventually. I'm just about to post an update for the fix I (finally) found. My experience with the Gigabyte 7770 OC, rev 1 has been very similar. Tried all variations of open source and proprietary AMD drivers. With the open source drivers I have not been able to run games like HoN and running it through Wine gives me about 10 fps. Dota2 through Steam got me from 4-5 fps (open source) to 15 fps on the AMD drivers which in essence still makes gaming useless on Linux. AMD please step it up. So far -1 from me.